Breaking News! We’ve just learned that Site C will be debated in the B.C. Legislature today! Sep. 30th, 2015. Please join us for a lightning rally in front of the Legislature today, Wednesday, September 30 from 12:30 p.m. to 1 p.m.
Last week B.C. mayors and councillors asked the B.C. government to hit “pause” on the Site C dam. They are concerned about Site C’s impact on families and communities across B.C. The dam would destroy agricultural land that can feed 1 million people, and leave us footing the $9 billion bill for power generation that we don’t need. Please bring signs! 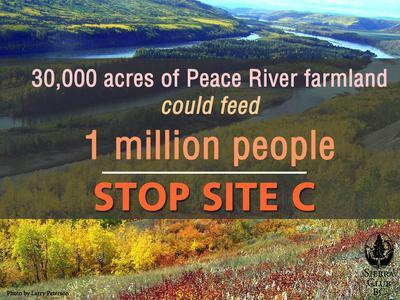 Remind our MLA’s and the media that Site C would flood prime farmland at a time when food prices are rising. Site C is strongly opposed by Treaty 8 First Nations and is being challenged in court by West Moberly and Prophet River First Nations as well as Peace Valley landowners. The B.C. Government and Service Employees Union and Canadian Farmers’ Union also strongly oppose the project. When: 12:30 p.m. - 1:30 p.m.